It felt so incredibly amazing to walk back into Dodger Stadium today. Even though it was an exhibition game. Hopefully the Dodgers can poke their heads out of the ground now that it’s time to play for real! 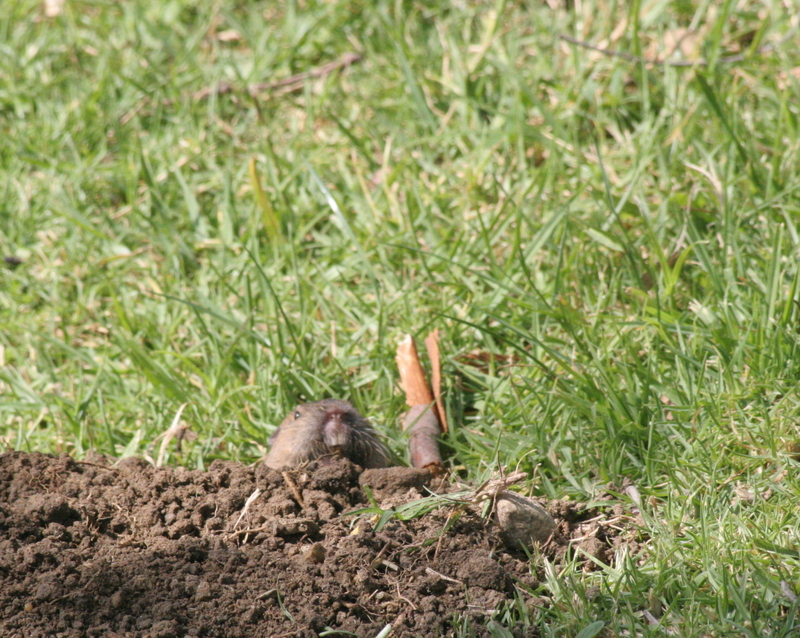 Yes, that’s a real gopher … I was waiting outside my usual gate when the dad in the car in front of me noticed the gopher poking its head out. His little boy (had to been no older than 2) didn’t like seeing the gopher very much. At the gate, I met Dennis and Thomas. Dennis was bringing his son to his first game and wanted some tips. I told him what I knew, which isn’t too much. I showed them how to get into the field level for “batting practice” and he took Thomas down to the “Kiddie Corral” to try and get an autograph. It didn’t look too promising. I wondered if he remembered me telling him to come back to the left field section if the kiddie corral didn’t work. 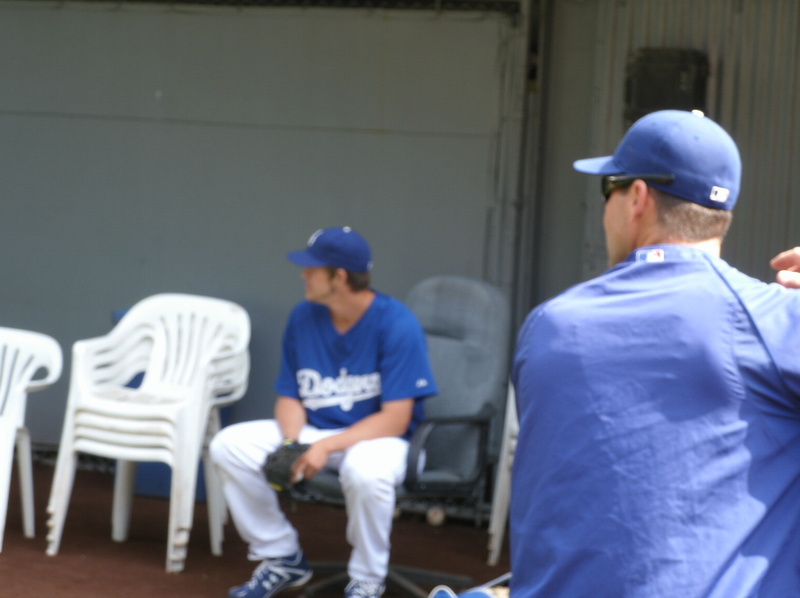 Clayton Kershaw and George Sherrill were in the bullpen when I got there. Sherrill was having a bullpen session (or a simulated game? There was a “batter” standing in front the catcher swinging an invisible bat). Padilla came out to run and said “not today” when asked for an autograph. There was another player out, one I didn’t recognize. Charlie Haeger came out with a trainer to run a few sprints. He was one of the two players I had hoped to see today. Okay, so I wanted Padilla and Kershaw’s autographs too … but didn’t think I’d have a good chance of getting either one of them. Turns out I was right. Charlie however … I called out to him and held up the little picture of him that I cut out from Friday’s copy of the L.A. Times. I’m so glad to have my Times subscription starting up again. I’m going to try a new method this year. I want to get the pictures autographed BEFORE I put them in my book. Charlie said he’ll get to me later. Sure enough, he ran and then came over to sign for me. I told him thanks for being my first autograph for my 2010 book. He said, cool. I think. After he took a quick photo with me, he signed two or three more before going in. Sure enough. As soon as I got ready to get my picture taken, the wind started blowing my hair into my face. Before Charlie came by, I was starting to get worried that my day-game-streak was coming to an end. I have been to 5 straight day games (8 of 9) where I have gotten either a ball, autograph, or photo from a player. Thank you Charlie for keeping my streak going! 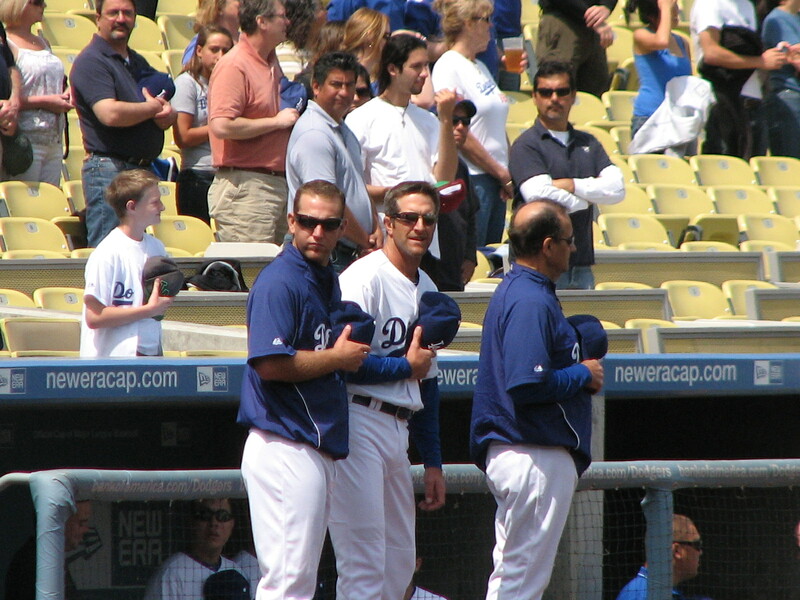 After Charlie signed for me, the security guard on the field came over to stand behind him. They do that whenever a player starts signing. It was the same guard from last year. I was surprised when he shook my hand and talked to me. He didn’t talk to me much last year, mostly he talked with Cat. Once I got my autograph from Charlie, I didn’t have to wait around the area anymore. I got asked my several people who it was who signed for me. I went to say hi to Ernie, Cat’s dear usher and mine as well. As I was talking to him, I realized what time it was. I was late to meet Kristin! Long story short: Cari invited me to Opening Day and gave my ticket to Kristin to give to me. She knows I like to get there early. It was 11:45 and I was supposed to be at the side entrance (where the smokers go out to smoke) between 11:30 and 11:45. No Kristin. I called her and left her a message. No, I didn’t miss her. Not only did I get my ticket from Cari for Opening Day, I also got my ticket from Kristin for Opening Night. I can’t say enough how wonderful my Dodger friends are! Since it was about another half hour till first pitch, I decided to go look for Pat and Cat and anyone else. Funny thing was, I was stopped a few times by a few ushers and security who were welcoming me back. The one that surprised me the most was when a security guard said, “no more wolf hat this year.” I stopped and tried to remember if I ever talked to him. I couldn’t think of a time last year in any of the 14 games where Wolfie started had I talked to this security guard before. Yes, I went to 14 of Wolfie’s starts last year. He had 2 wins, 2 losses, 10 no-decisions (Dodgers had 7 wins, 3 losses) and that’s not including his one post-season start where he got yet another no-decision and the Dodgers won. By the way… of Wolfie’s 16 no-decisions, 11 of them were at home and 5 were on the road. I found Cat and she was busy collecting autographs from Angel players for one of her blog friends, Mimi. She hit the jack-pot when it came to autographs! Now, Cat doesn’t like having her picture taken … but I think this is lovely picture of Cat in her dugout club seat. Charlie Haeger and Casey Blake look a little… surprised by Alvin, Simon, and Theodore’s rendition of “America, the Beautiful” before the Star Spangled Banner. I stayed in my spot for the first inning. 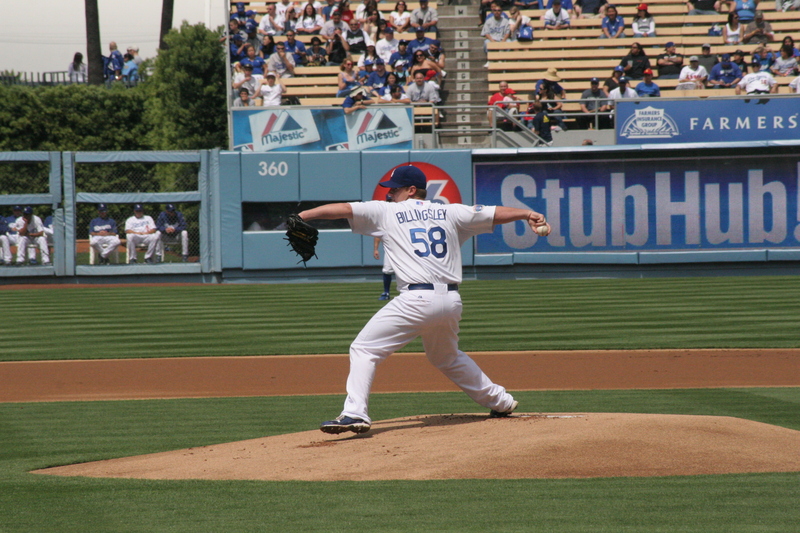 I wanted to get a good picture of Chad Billingsley throwing the first pitch. 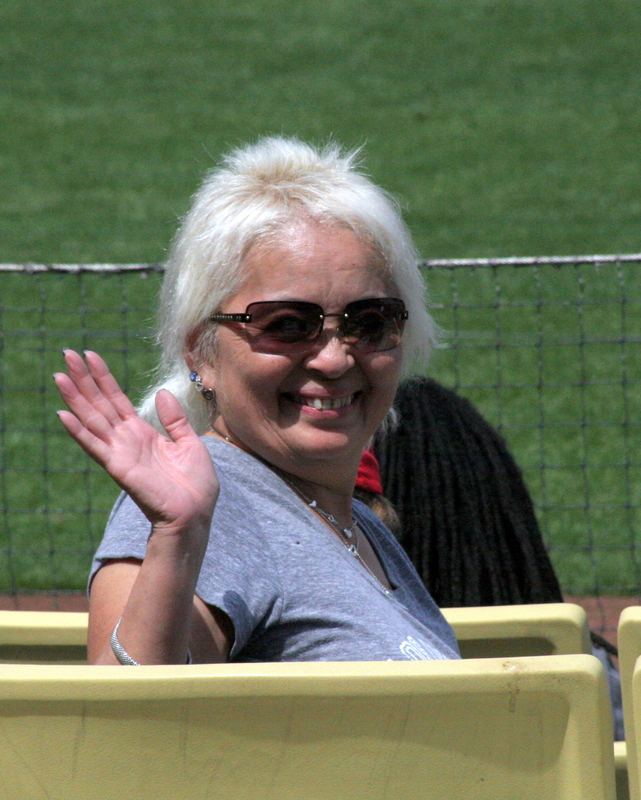 Then in the top of the second, I started making my way to Cat’s season seat, since she was in the dugout club. I was greeted and welcomed by a few more ushers. 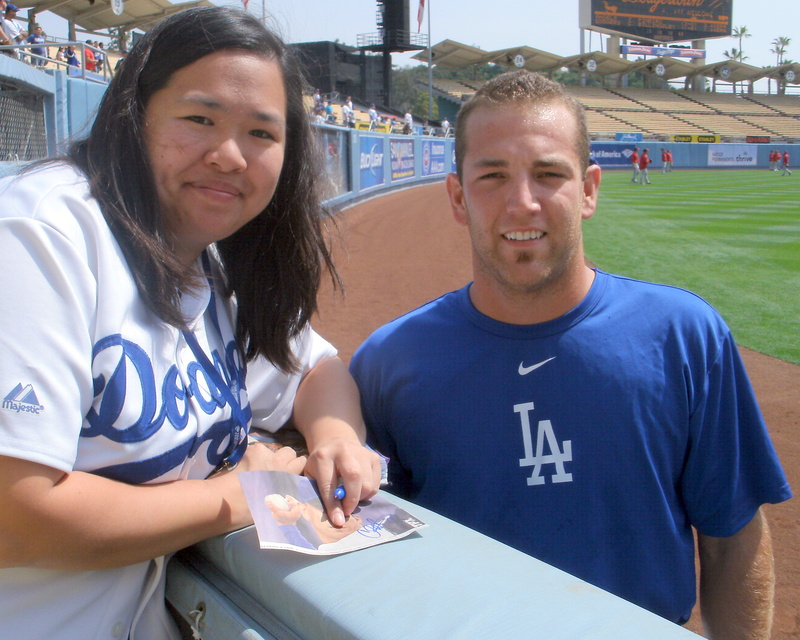 Like Cat said in her blog, I was extremely touched by the welcome I received from all the Dodger employees I met last year (and even a few new ones this year). At first I thought this was going to be a hot dog. It was wrapped up in napkins so I didn’t know what it was. I just assumed a Dodger dog. When I pulled it out, I realized it was too small to be a Dodger dog. 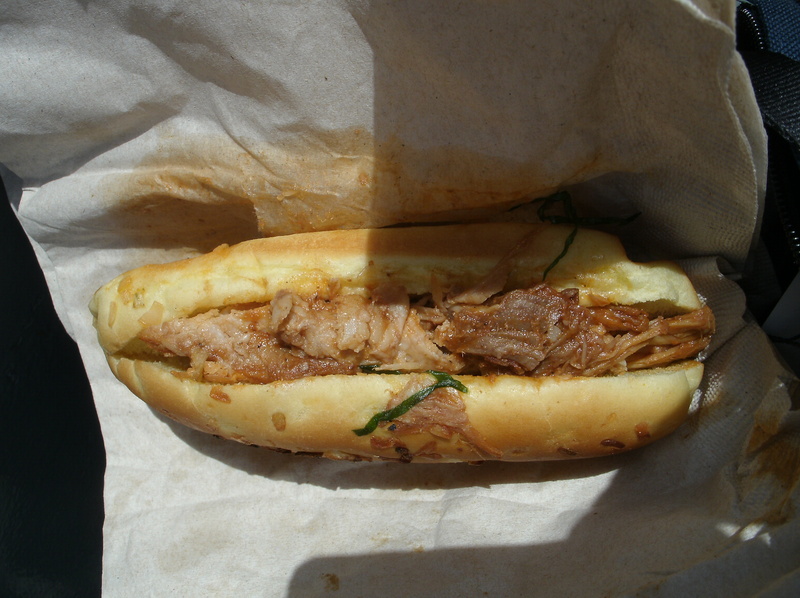 My guess is, it was a pulled bbq pork sandwich. It was incredibly amazing! pitch later that game. He did. He came in and did really well. I was glad for Kuroda. Too bad for Bills though. Martin going 2-for-5 in the lead off spot as the Designated hitter. It was great to see all my Dodger friends and Dodger Stadium employee friends (Rudy, Francis, Juan, Ernie, Robert, Kenneth and everyone else whose names I either forgot or still need to learn)! It had only been about two months since I last saw Pat and Cat … but two months felt like a long time. I can’t wait to see JoAnna. I haven’t seen her since November? this game? Not much. (No one even corrected me that I did the math wrong on his age. I knew we were year apart… but I went the wrong way). He’s a knuckleballer. One of the very few left. Before the game, we were sitting in Cat’s seat while she was gone so no one would take her spot. Kids are always crowding her seat during batting practice. She was getting food and Nina was sitting in her seat. 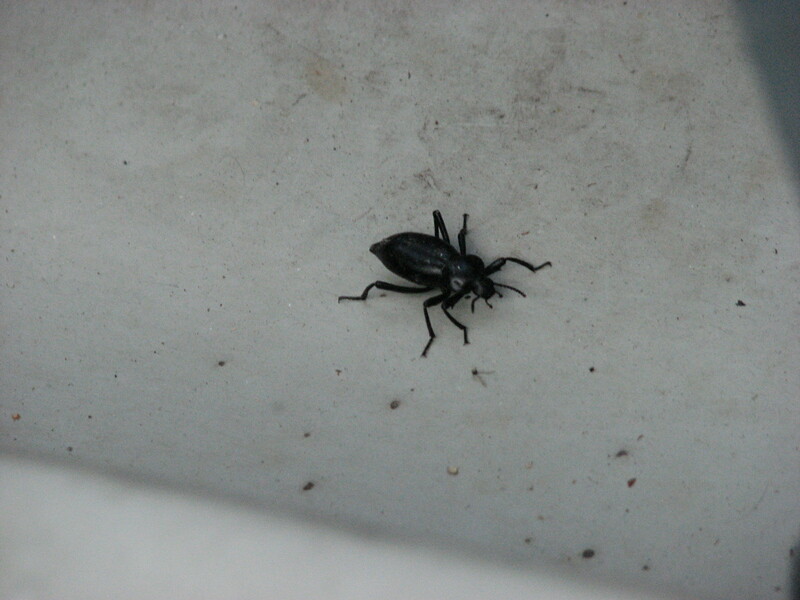 I noticed this little critter coming down the aisle under the seats. Ick! There was an open spot between two guys along the wall since Nina wasn’t standing up. This kid came down my aisle and then came towards Nina. Nina stood up to let him walk by, but he stepped in front of her instead into the open spot along the wall. As Cat was coming back, we told the kid to skedaddle. 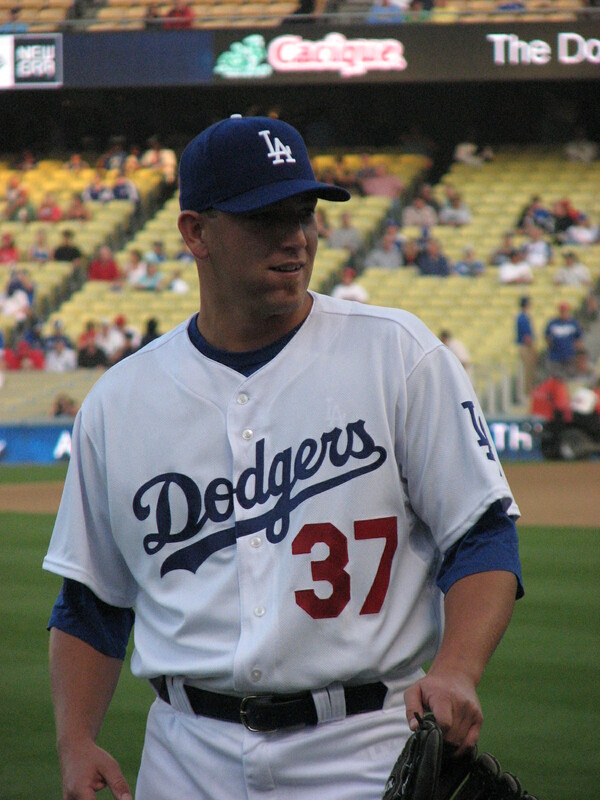 Charlie Haeger, talking to a fan he had seen in Arizona as well. No, it wasn’t Roberto (who was in Arizona on Sunday and San Francisco on Tuesday. Both of them were Wolfie starts). 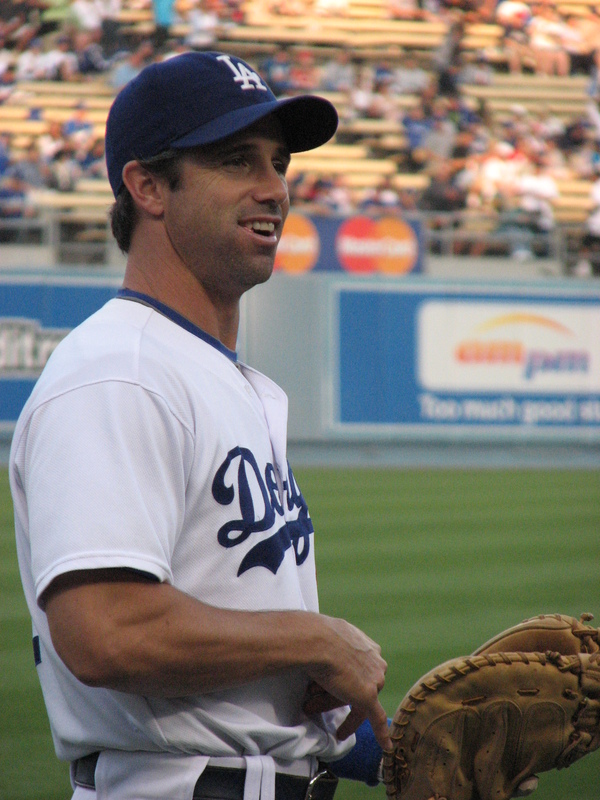 Brad Ausmus had seen the same guy too apparently. Note the extra big glove. Just as the National Anthem was being sung, we found JoAnna. Then we made our way to our seats. We sat with JoAnna for awhile. A very long while. And it helped that the first six innings of the game when by very quickly. After all, Charlie was pitching very quickly. I think they said he threw like two fast balls and everything else was a knuckleball. 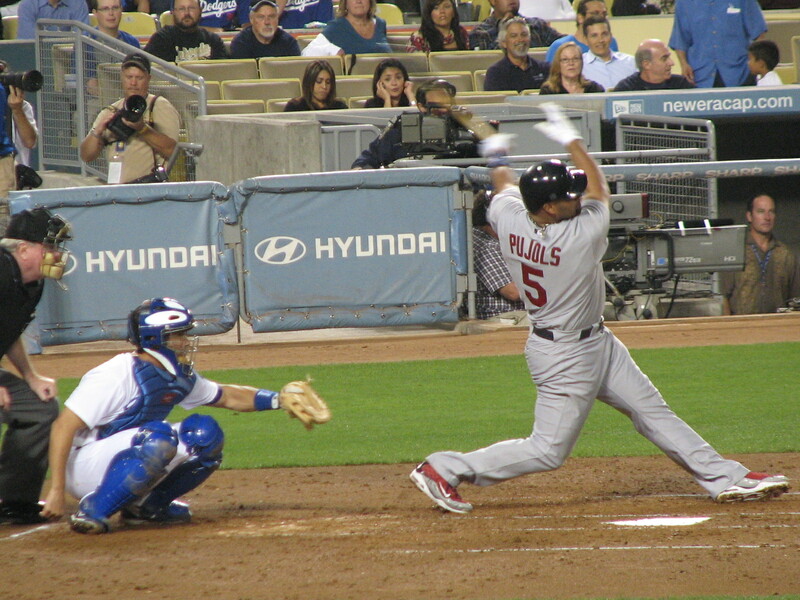 Don’t shoot me… but I got a picture of Albert Pujols’ home run off Haeger. Game tied, 1 – 1. The Dodgers took the lead, 2 -1. Then Rick Ankiel hit a two-run homer to give the Cards the lead. We missed it because we were going up to our seats. I wanted to say hi to Chelsea and Chris. We got up there, and Chris looked at his watch. Kinda late? LOL, well, we were sitting with our other friends for the first six/seven innings. Then we decided to sit with our other friends for the last two. I showed them the picture of Pujols and stuff. Chris had said at the last game that he would like to see a Pujols homerun. I did too. I’m just glad it was a game-typing homer and not the game winning one. Made it easier to take.